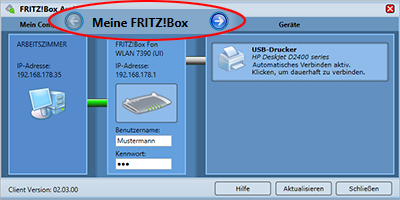 With the FRITZ!Box USB remote connection software you can also access several FRITZ!Boxes and FRITZ!WLAN Repeater N/Gs in the home network. This way you can use the FRITZ!WLAN Repeater to play music on your stereo system and at the same time connect a USB printer connected to a FRITZ!Box to your computer, for example. On your computer, double-click the FRITZ!Box USB remote connection icon in the notification area of the Windows taskbar (Systray). Use the arrow buttons above the middle section of the FRITZ!Box USB remote connection software to switch between the AVM devices (see fig.). Note:The arrows are only displayed if there are several AVM devices in the network with the USB remote connection enabled. If password protection was enabled for a FRITZ!Box in its user interface, enter the password and leave the "User name" field blank when you access it. Now you can connect the USB devices or the audio bridge enabled for the selected AVM device to your computer.